It would be easy, and somewhat accurate, to describe Homer Simpson as a bad father. He’s selfish, dismissive, and generally refuses to take any interest in his children’s lives unless prompted or provoked. He learned his stubbornness and casual indifference from his old man, but he picked up his more buffoonish qualities all on his own. Though Homer’s marriage and the birth of his three children are easily the best things he’s ever accomplished on purpose, he regularly forgets this fact (some would say every week) and it’s only when he screws up in a myriad of different ways does he remember the importance of his home life. Homer Simpson is the id of the American everyman run amok, which basically means that fatherhood is guaranteed to be a struggle for him, even if he’s completely oblivious of that fact. But as any avid viewer of The Simpsons will argue, labeling Homer a “bad father” doesn’t really tell the whole story. If anything, it’s a crude, reductive portrait of a complex character. Homer embodies both the best and worst qualities of American life. He’s obnoxious and lazy, dumb and impulsive, and never really learns from any of his mistakes, but he also harbors a fundamental decency and innocence. Though he almost always comes up short in the husband/father department, he never stops trying. It’s Homer’s dogged determination to try and try again despite all evidence to the contrary that point to his big heart. Last week, Les Chappell discussed the phenomenon of “Jerkass Homer” as an explanation for The Simpsons’ steady decline after its first decade, and while that reason is largely compelling, it’s easy to forget that Homer didn’t suddenly become a jerk after Mike Scully took over as showrunner. Homer was always a bit of a jerk, but he was a jerk in an understandable way. He lashed out against perceived social ills because of his own insecurity or misguided principles, arguably the most relatable jerk-like behavior, but the writers always grounded Homer’s worst impulses or checked them through other characters. Any long-running sitcom will necessarily heighten their characters’ most superficial traits and rely on broader and broader tactics to mine laughs from their premise, but Homer was always a delicate balance. He needed to be as human as possible so he could become a cartoon, a lesson The Simpsons’ writers often forgot in later years. “Bart Star” definitely features “Jerkass Homer,” but it also features him trying to be a good father, only for him to realize that he was just making everything worse. It’s a well that The Simpsons have returned to again and again since its beginning, and “Bart Star” is certainly a cruder version of earlier premises, but it nevertheless works well as a post-Golden Age episode that has its heart and funny bone in the right place. After a Springfield health convention declares the town’s children to be overweight, local parents decide to enroll their children into a peewee football team coached by Ned Flanders. Flanders and quarterback Nelson Muntz help keep the team undefeated, but Flanders quits after Homer constantly taunts and mocks him in the stands because, well, he’s Homer and that’s how he acts when he sees glory and respect bestowed on a person he deems unworthy. 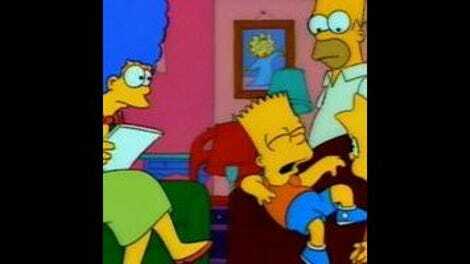 Once Homer takes over the team, he initially taunts and abuses Bart for not being a good player, but when he remembers how his father treated him as a child, he decides to blindly encourage Bart instead. 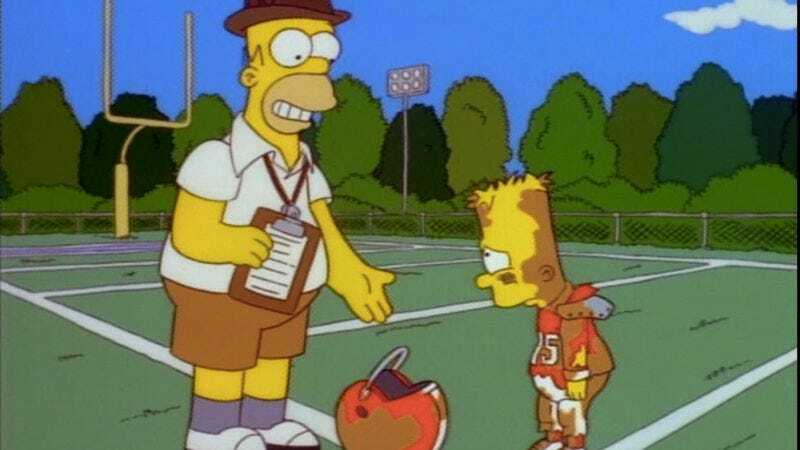 He callously cuts many players and makes Bart the quarterback to the fury of Nelson and the rest of the team who know Bart can’t play the position. After Bart ruins their undefeated season, he furiously quits the team when he realizes Homer is blind to Bart’s crappy athleticism. Eventually, Homer and Bart reconcile, and during the championship game when Chief Wiggum comes to arrest Nelson on burglary and arson charges, Bart offers to pretend that he’s Nelson so that the team can finally win the championship (though he’s unaware of the severity of the charges at the time). “Bart Star” works well precisely because writer Donick Cary grounds Homer’s mean-spirited and delusional behavior in his own character history as well as recognizably human psychology. Homer hates Flanders because he’s everything he’s not—a great father and husband, a positive role model, and an active participant in the community. Although Flanders is technically a good person, he’s also an insufferable goody two-shoes who unintentionally attacks others with his smug self-regard, which makes Homer’s hatred of him easy to swallow most of the time. The initial problem with “Bart Star” is that Flanders acts perfectly normal in relation to Homer who truly flexes his obnoxious side by constantly taunting him and eventually beaning him with a beer can. Cary slightly tempers the behavior by having Marge and Lisa actively call out his cruelty and stupidity, as well as Homer all but admitting his grudge is irrational while on the phone with Roy Firestone, but seeing Homer act so unreasonably cruel to someone who clearly doesn’t deserve it is never that funny or compelling. But once Homer takes over the team, his actions become perfectly reasonable even in their own outlandish way. Homer tries to right the wrongs of his father by actively encouraging Bart and making him quarterback, but he refuses to accept that Bart is a terrible player. He tries to be a Flanders-type dad, but because he has Simpson blood in him, he mucks it up and alienates Bart from the rest of his teammates. After Bart quits, Homer realizes he’s lonely coaching the team without his son and apologizes to Bart, promising never to encourage him again. Cary understands that one of Homer’s best qualities is his willingness to swallow his pride and admit when he’s been wrong, even if it takes him twice as long as everyone else to figure that out. Though “Bart Star” doesn’t really earn all of its emotional beats, mostly because the script’s pacing is off (Bart quitting the team, Homer realizing his mistake, and their reconciliation all take place in the third act), the ending still retains some sweetness to it, even if it’s a minor imitation of earlier efforts. Despite some jauntiness, a few strained moments, and a phoned-in ending, “Bart Star” is still a reasonably funny installment of The Simpsons, with plenty of comedic highlights, especially in its first act (“You doctors have been telling us to drink eight glasses of gravy a day!). Like last week’s episode, “Bart Star” embodies some irritating and groan-inducing comedic and narrative trends that the series will exploit more and more, but overall, it’s as delightful and light as any bottle of Skittlebrau. Joe Namath has one of the strangest, most random, and funniest cameos in Simpsons history. He’s more interested in lecturing the audience on the dangers of vapor lock than helping Bart be a better quarterback. Homer’s “cutting” joke is a little bit lame and definitely overstays its welcome by the end of the episode. A cameo appearance by Hank Hill, whose own show King of the Hill premiered in January of 1997! Apparently Homer was a gymnast in high school? One of my favorite Simpsons jokes is Abe, Jasper, and Crazy Old Man’s reactions to the hearing test. I always crack up at Jasper slowly raising his hand until Abe shakes his head.